ATLANTA, Ga. – Call ‘em whatever you want, rank ‘em wherever you want. To the UCF Football team, the outside perception doesn’t matter anymore after ripping a 34-27 victory from the No. 7 ranked Auburn Tigers. In their minds, the Knights are the best team in the country. In their minds, UCF stands atop the football world. “I said on the podium, you can go ahead and cancel the playoffs; I’m not changing my mind,” emphatically reinforced McKenzie the confetti had settled. Even as the nation’s lone undefeated team, UCF had been heralded as the David to Auburn’s Goliath. They were touted as an undersized and overperforming squad of young, exciting talent at would crumble under the weight of Auburn’s heavy-handed physical gifts. Auburn had knocked off two of the College Football Playoff’s contenders and kept it within a touchdown of a third, making a reasonable case that they could be the nation’s top dog at any given time. They stood atop the blue-blood powerhouses and bellowed dominance with their play, leaving little room for anyone to hype up the underdog. “Yeah, it’s no better feeling than coming into a game being the underdog, and everybody going around telling you that you can’t win, and people say we going to lose by this much and that much,” gleefully expressed Shaquem Griffin. Griffin was a one-man army, wreaking havoc with malicious giddiness. He officially ended the day with 1.5 sacks, 3.5 tackles for a loss and 12 total tackles. He should have bought a timeshare in the Auburn backfield for all the time he spent there, vacationing where Auburn Quarterback Jarrett Stidham nightmares. UCF’s defense was lights out, flipping the usual switch and keeping their offense in the game – even as McKenzie ended the first half with all of fourteen passing yards. Five total sacks, a fumble recovery, two interceptions and a touchdown negated the equally stifling Tigers’ defense, who would hold UCF’s offense to 27 points. The offense took some time to get going, finally finding a rhythm in the second half. Auburn had physically smacked UCF around all game. Adrian Killins was picked up and bodyslammed on multiple plays. Otis Anderson was picked up and tossed around like a rag doll, and McKenzie weaved between linemen that could have shot-put him to the other side of the field. At a certain point it seemed that the War Eagle defense was more interested in doling out punishment than in nullifying the danger of a UCF offensive streak. They wanted to remind the Knights of who they were, mentally take the slight of frame from the competition. Beat up and ragged, the Knights managed to put the rock in the end zone three times in the second half. Otis Anderson took a twelve yard pass in with the help of an entire offensive line moving the pile, Dredrick Snelson hauled in an eight-yard dagger in the back of the end zone, and Chequan Burkett lit the atmosphere on fire with a late-game pick-six. For all of the distractions, doubts and disappointments in a topsy-turvy undefeated season that shipped their head coach off to another program, this is well-earned. Perfect through thirteen seemed impossible to almost anybody outside of the program a few short months ago. “What our kids accomplished and overcame, they overcame playing 12 weeks in a row, or 11 weeks in a row, to finish the season without a break, coming off a hurricane, having schedules change, having a Saturday game, and then coming back and playing away – and then coming back and playing a Friday game on the last game of the year, and then turning around and winning the conference championship, coming here with a coach that took another job and all those distractions, and finding a way to get it done – I didn’t know if these guys would be able to do it,” admitted Coach Frost after the game. Frost has officially closed the book on his time at UCF, riding off into the sunset with perfection at his back. 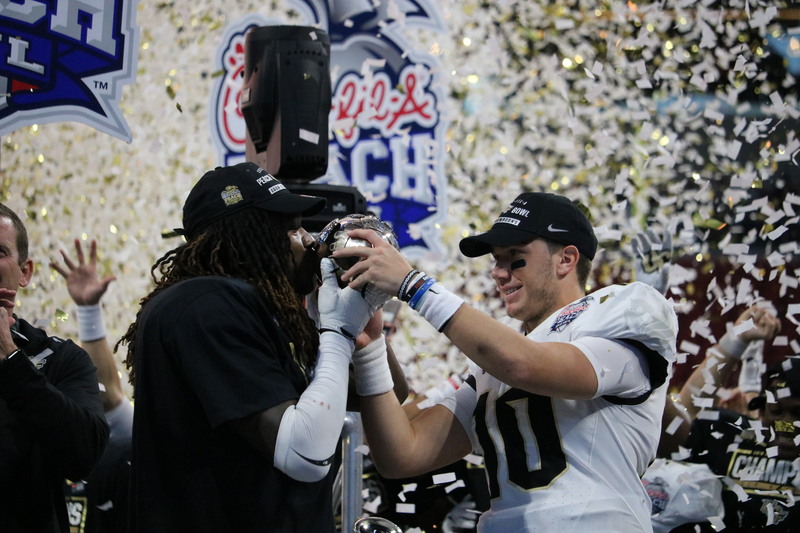 UCF has finished the mission, answering McKenzie Milton’s call to action before anyone else knew how dangerous this team could be.